Top row (left to right): 1. unidentified, 2. James McDowell, 3. Linda Green, 4. Debra Hughes, 5. Terri Andrus, 6. Darrell Cook. Second row: 1. Connie Richards, 2. Diane Thompson, 3. Laurie Hendrick, 4. Richard Sobers, 5. John Coronado, 6. unidentified. Third row: 1. James Allmon, 2. Karla Tastoe, 3. Daniel Loyola, 4. Vicky Ross, 5. John Hernandez, 6. unidentified. Fourth row: 1. Phyllis Cameron, 2. unidentified, 3. unidentified, 4. Robert Kerlin, 5. Cindy Robbins, 6. Cheryl Eiden. Fifth row: 1. Carol Snodgrass, 2. no picture, 3. no picture, 4. no picture, 5. no picture, 6. Becky Willis. Sixth row: 1. Ken Stewart, 2. Mr. Allison, 3. no picture, 4. no picture, 5. Mr. Gaynor, 6. David Drummond. 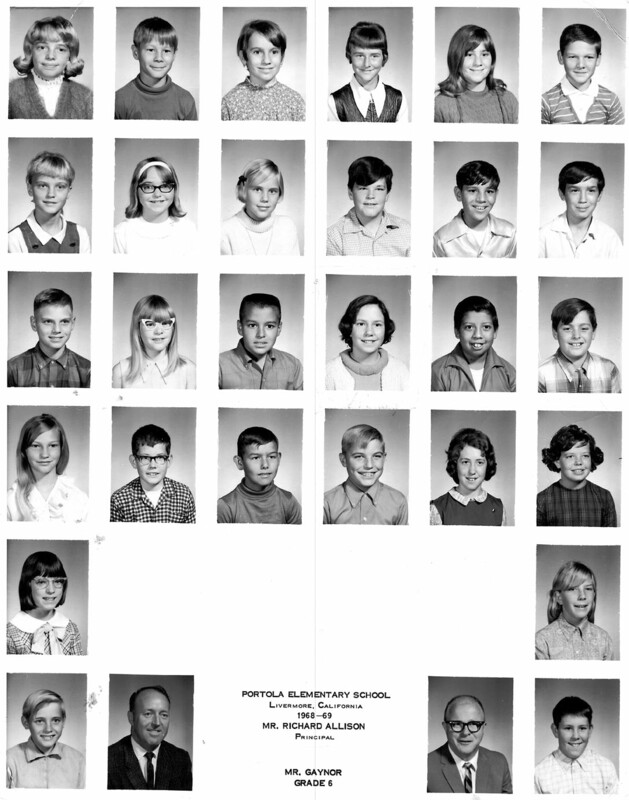 This sixth grade class was assigned to Portola Elementary School, as it says on the picture, but the class met at Junction Avenue School. According to Diane (Thompson) Mueller, the school district had just built Portola and planned on making it a kindergarten through sixth grade elementary school. Junction was to be a middle school with just seventh and eighth grade classes. But Portola didn’t have enough room for all the sixth grade classes that year, so Mr Gaynor's class was left at Junction. Diane recalls that the class met at Junction, but would walk over to Portola for various assemblies. The next year, Junction included sixth, seventh and eighth grade classes.